Treasure Isle Marina offers monthly slip rentals, short term Guest Docking and Day-Use priviledges for recreational boaters. Amenities include showers, restrooms and pump-out facilities. Non-slipholding recreational boaters should contact Marina staff directly regarding Guest Dock availability and Day-Use fee is required. Recreational vessels may anchor in Clipper Cove. Any vessel planning to anchor in the Cove for longer than 24 hours (including vessels intending to come in-and-out over the course of several days) must obtain a no-cost Anchorage Permit, issued by TIDA. Anchoring in Clipper Cove or possession of an Anchorage Permit does not allow boaters access to Treasure Isle Marina facilities. Anchored vessel owner/operators should contact Marina staff directly to discuss the Marina's day-use policies and associated fees. Vessels anchored for an afternoon or single overnight of less than 24 hours are not required to possess a Clipper Cove Anchorage Permit. There are two levels of Anchorage Permits available based on intended length-of-stay. 2. After submitting all required information in the manner specified above, the Short-Term Permit is considered issued unless vessel owner/operator is subsequently contacted by TIDA or the San Francisco Police Department (SFPD). 1. Complete the one-page Long-Term Anchorage Permit Application at the Treasure Island Development Authority office during regular weekday business hours. 2. Upon TIDA review and approval of the completed Application, vessel owner/operator is issued a hard-copy Long-Term Anchorage Permit. 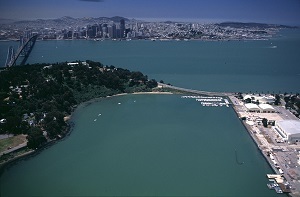 This Long-Term Anchorage Permit must be kept on-board the vessel at all times and must be furnished when requested by TIDA, TI Marina staff or the SFPD. Anchorage Permits are issued at no-cost to recreational boaters. Anchorage Permits do not allow the bearer privileges for the TI Marina Guest Dock or TI Marina Day Use. Anchorage Permit holders must make all such additional arrangements directly with TI Marina. Violation of San Francisco Police Code Section 1.1 and/or of the Clipper Cove Special Use Area Rules and Regulations is considered grounds for revocation of a Short-Term or a Long-Term Anchorage Permit. Violators may be subject to issuance of a Notice of Violation, issuance of an Administrative Citation or removal of vessel from Clipper Cove. Back-to-back Anchorage Permits will not be issued to vessels or vessel owner/operators (Long-Term, Short-Term, nor any combination thereof). Once an Anchorage Permit is issued, the vessel and vessel owner/operator are not eligibile for a subsequent Anchorage Permit for 21 days after the expiration date of the current Anchorage Permit. Commercial vessels are not eligible for Short-Term or Long-Term Anchorage Permits. Commercial operations and anchorage by commercial vessels in Clipper Cove without prior TIDA authorization are prohibited. Vessels shall not anchor past expiration of an Anchorage Permit without explicit TIDA approval. TIDA approval of Anchorage Permit extension is dependent on either a.) verifiable proof of threat to life safety or property safety created by movement of vessel at time of Anchorage Permit extension, or b.) imminent verifiable unsafe local weather conditions at time of Anchorage Permit expiration. Requests for Anchorage Permit extension shall be submitted in writing to the TIDA Office, c/o the TIDA Director of Island Operations, prior to the Anchorage Permit expiration. Click here to look-up Clipper Cove Administrative Citation status and pay Citation Fees.